For the last month, archaeologists have been scraping, sifting and digging around a 19th century home in the city’s Old Irving Park neighborhood, creating what might look like a mess in the yard. But there’s a method to their madness. Neighbors have suspected for decades that this home was a stop along the Underground Railroad, the network of people and locations helped slaves escape to freedom. It was built in 1856, by Cook County’s first Republican Sheriff John Gray and his wife, Pheobe. But it wasn’t until after his death that obituaries named him as an abolitionist. “A while back there was a recordation of a tunnel collapse by the Gray’s … second house in the area, so it sparked a lot of rumors,” said Lake Forest College junior Caitlin Lamb. Lamb is now among a team of students and volunteers digging up the yard, at the request of homeowners Kris and Dave Cloud, who’ve been here about four years. “We’ve considered landmarking the house to protect it from being torn down or being developed,” said Kris Cloud. The couple is trying to prove a connection to the Underground Railroad to help with that process. Could this strange brick room in Old Irving Park have been a station along the Underground Railroad more than 160 years ago? A couple of years ago, the Clouds discovered this strange brick-lined room in the basement. At the time, it was full of debris and rubble. “A preservationist friend of ours said don’t touch it, it could have some historic value,” Kris Cloud said. Now professor and archeologist Rebecca Graff is leading a team of researchers at the home. After a month of work in the basement and the yard, Graff says they found some surprising items. A last-minute pit dug under the front porch yields some artifacts: mammal bone that’s been professionally butchered, pieces of a child’s Humpty-Dumpty mug, and lots of broken glass and china. The dig has been attracting attention from curious neighbors and history buffs. What researchers are looking for here is hard to find. 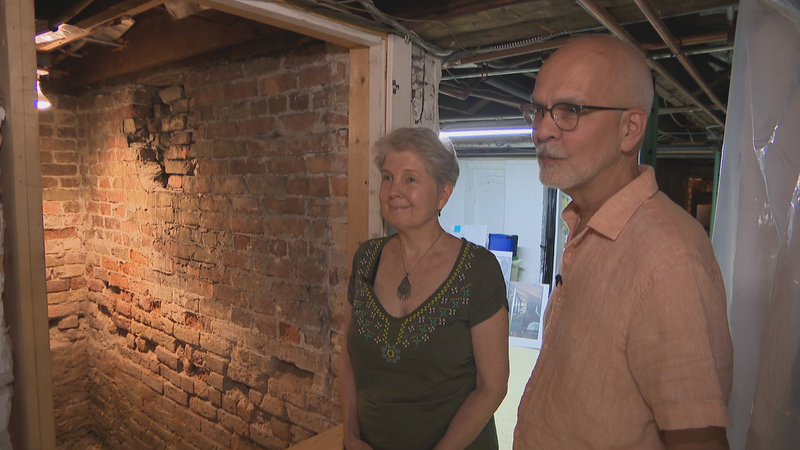 Evidence of an Underground Railroad was intentionally hidden, and while the treasure trove of artifacts found recently under this porch may get them closer to truth, much of what happened here may always remain a mystery. Graff says while these artifacts may never answer the question, “Was this house on the Underground Railroad?” they are still significant. “The archeology gives us a chance to find out more information about working-class people, people of color, women, children, people whose experiences of life are not captured and archived, and that makes it important to me,” Graff said. And that room in the basement? It could have been used for ice storage or a root cellar. Whatever comes of this research, the Clouds hope it answers some questions for the community. And it if is true that the former sheriff broke a law by helping slaves escape to freedom, he’s a hero, says Kris Cloud. Graff says many of the artifacts found at the Gray-Cloud house will need to be studied and verified in her lab to find out their exact dates. She hopes to know more about them by the end of the year.